Overlooking the Thames at 190 Strand, Yen follows in the footsteps of its successful sister restaurant located in the St Germain de Près area of Paris and offers traditional Japanese cuisine, specialising in buckwheat soba noodles. Guests are able to experience the art and theatre of the twice-daily noodle preparation by the restaurant’s soba specialists, Maruno Hidenori and Katsuki Sakurai, within a bespoke glass space on show to all the restaurant. Both Maruno and Sakurai trained with the “Master of Soba” Mr Takahashi Kunihiro in Yamanashi, Japan. Sybarite embraced the challenge of the initial design brief set by Onward Holdings Co. Ltd., the Japanese fashion company which includes Joseph and Jil Sander in its portfolio – in cohering with Japanese materiality, design cues and construction techniques. High ceilings emphasise verticality and light, and a timber treescape structure inspired by bamboo forests to recreate a tree canopy effect. 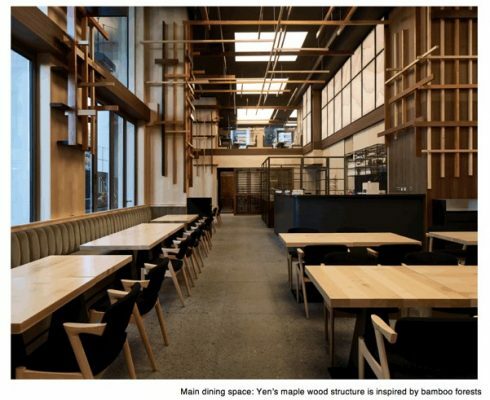 The Japanese wood of choice, maple, has been positioned in varying thicknesses and tones around columns and across the ceiling and together, the contrasting widths of the structure allow a play of light and shadow which give the vast space a sense of both depth and intimacy. A standout design detail is a lightweight floating timber staircase that connects the entrance to the main dining floor below. It appears as a full timber cantilevered monocoque construction, however cleverly concealed steel engineering creates a robust structure. Each timber section was carved from a single block of maple timber using artisanal carpentry methods. 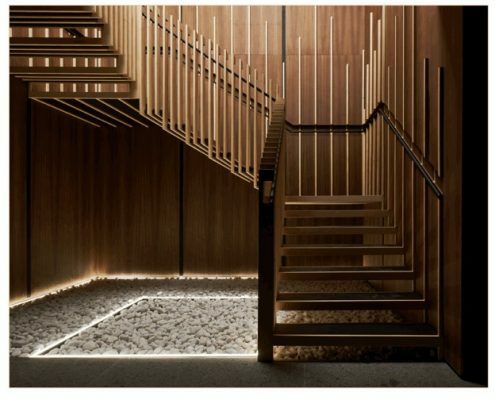 The staircase was a stylistic addition that Sybarite added to the brief to aid impact on entrance, allowing diners to step off the busy street into an all-encompassing Japanese experience. At the base of the stair a white cobbled garden feature includes a 6m tall real bamboo sculptural centrepiece. Guadua and natural black bamboo poles were chosen to create contrast, similar to the multi-tonal maple treescape. A sushi counter has been created from yellow cedar timber, which is traditionally used in Japan for many applications from housing structures to shoji screens. Japan is one of the biggest importers of yellow cedar. At the mezzanine level, perforated Japanese inspired maple window screens have been applied internally at the entrance area to provide a greater level of privacy for customers while still maintaining views into and out of the restaurant. Within the restaurant’s private dining room, ambient back lighting showcases the delicacy of paper used for the Japanese inspired goutenjou (coffered) ceiling. The floor in the private dining room has been designed to mimic traditional Japanese tatami matting using Bolon woven vinyl flooring and black rubber trims – a modern robust twist, fit for restaurant application. 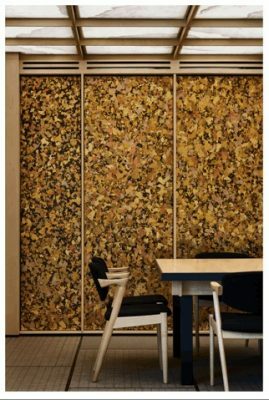 Both the private room and mezzanine spaces feature Japanese style metallic hand painted wallpaper by Misha, chosen for the leafy textures which are a subtle nod to the bamboo forest concept. The restaurant is circa 450 sq. m. and seats 109 covers, including an 18-seat private dining room, and a sushi counter.